Foodies are in for a big treat this month. (SPOT.ph) Megaworld Lifestyle Malls just opened the biggest gathering of food trucks in Metro Manila this month, courtesy of McKinley West's Food Truck Festival. From October 1 to 31, running from Thursday to Sunday, the festival will bring together many of city's most popular food trucks, including Shawarma Bros, Jet 7 Bistro, SWAT (Sausage with a Twist), Hungry Rover, Bagwings Chili Wings, Bagnet by Crazy Chef, Cheesesteak Shop, Malcolm's Burger, Mio Gelati, FIC (Fruits in Ice Cream), Kombites, and Sugartrails. Live performances from Pedicab, Clara Benin, Paranoid City, She's Only 16, Taken by Cars, BP Valenzuela, Oh Flamingo, Flying Ipis, and Autoletic will also be at hand. There will be over 500 available parking spaces in the area, so be sure to be in the premises by 4PM. See you this weekend! 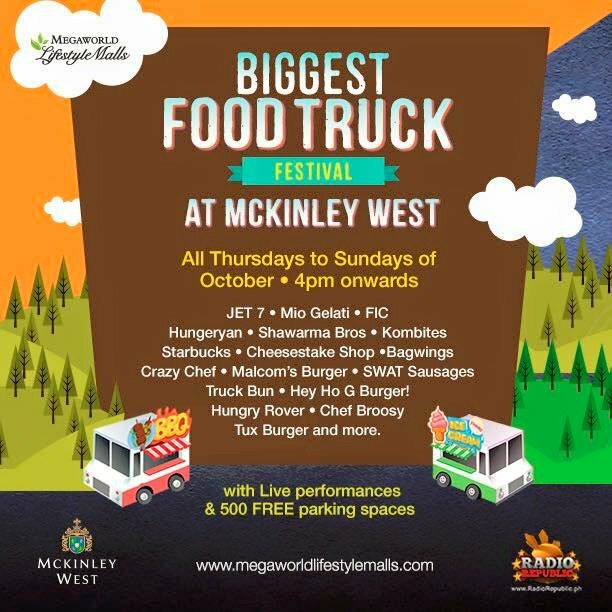 For more information about McKinley West's Food Truck Festival, call the Megaworld Lifestyle Malls Concierge at 709-9888, 709-0888, 0917-8380111 or visit www.megaworldlifestylemalls.com.